Objective To assess the sensitivity and specificity of decreased response to name at age 12 months as a screen for autism spectrum disorders (ASD) and other developmental delays. Design Prospective, longitudinal design studying infants at risk for ASD. Setting Research laboratory at university medical center. Participants Infants at risk for autism (55 six-month-olds, 101 twelve-month-olds) and a control group at no known risk (43 six-month-olds, 46 twelve-month-olds). To date, 46 at-risk infants and 25 control infants have been followed up to 24 months. Intervention Experimental task eliciting response-to-name behavior. Main Outcome Measures Autism Diagnostic Observation Schedule, Mullen Scales of Early Learning. Results At age 6 months, there was a nonsignificant trend for control infants to require a fewer number of calls to respond to name than infants at risk for autism. At age 12 months, 100% of infants in the control group “passed,” responding on the first or second name call, while 86% in the at-risk group did. Three fourths of children who failed the task were identified with developmental problems at age 24 months. Specificity of failing to respond to name was 0.89 for ASD and 0.94 for any developmental delay. Sensitivity was 0.50 for ASD and 0.39 for any developmental delay. Conclusions Failure to respond to name by age 12 months is highly suggestive of developmental abnormality but does not identify all children at risk for developmental problems. Lack of responding to name is not universal among infants later diagnosed with ASD and/or other developmental delays. Poor response to name may be a trait of the broader autism phenotype in infancy. In current practice, autism is not diagnosed until the third or fourth year of life,1-3 although parents tend to have concerns about their child's development much earlier, with 30% to 50% reporting initial concerns before the first birthday.1,4 Earlier identification of autism offers the possibility of early intervention, which holds promise for improving outcomes in children with autism.5,6 This has motivated a growing body of research that aims to ascertain the earliest reliable indicators of autism. One of the most consistently documented behaviors in infancy that distinguishes children later diagnosed with autism from those with typical development, or developmental delays, is a decreased tendency to respond to name. This decrease in “response to name” has been found across all studies that have used the method of retrospective home video analysis to identify early signs of autism. In these studies, behaviors observed in home videos of children later diagnosed with autism are compared with behaviors seen in early video of typically developing children. Some studies have also compared baby tapes of children with autism with those of children with nonautistic developmental delays. 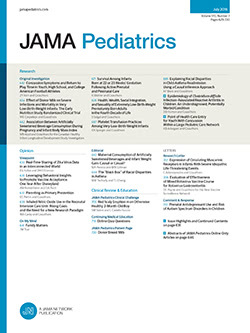 This work demonstrates that by their first birthdays, children later diagnosed with autism are significantly less likely to respond to their name than both comparison groups.7-13 Prospective studies have found that this relative decrease in responding to name continues to distinguish children with autism into toddlerhood.14,15 Consequently, lack of responding to name by 1 year of age may be a reliable early marker of autism, in combination with other behaviors such as decreased attention to faces. Retrospective home video studies have been valuable in suggesting behaviors that may predict autism, but this method lacks the control and rigor of an experimental approach. Furthermore, video is not available for all children and is a labor-intensive method of collecting information. Thus, it is not a practical tool for early screening.16 In addition, it has become increasingly clear that there are different trajectories in the development of autism and that symptoms are not consistent over time. For example, not all children with early social-communication delays will develop autism. Conversely, a subset of children with autism experience mostly normal development followed by a significant loss of skills between ages 12 and 24 months.17 These factors call for a controlled, prospective investigation of response to name, as well as an examination of its consistency at different points in development. Given the strong genetic loading of autism,18,19 infant siblings of children with autism are at increased risk for the disorder than infants in the general population. This has led to a new approach to examining the earliest signs of autism: infant sibling studies, which follow the course of development of infants at risk for autism, along with a group of control infants.20-22 Zwaigenbaum and colleagues22 conducted such a study, using an instrument they developed to assess behaviors relevant to autism in infancy, the Autism Observation Scale for Infants. At 6 months of age, they found no significant differences that discriminated at-risk infants who were later diagnosed with autism from other infants. However, at 12 months of age, infants who displayed 7 or more risk markers on the Autism Observation Scale for Infants, including not orienting to name, were more likely to obtain an autism classification at age 2 years. Beyond genetic risk for the disorder of autism, it has been established that some relatives of individuals with autism demonstrate milder but qualitatively similar behavioral and personality characteristics.23 These features are termed the broader autism phenotype. Studies have found that not only is there a higher risk of autism in younger siblings but also an increased risk of language delays.20-22 The specificity of the response-to-name marker to outcomes of autism (vs language delays or subthreshold communication difficulties) needs to be further explored. The present study investigates the tendency to respond to name in infants at risk for autism and infants with no known risk, via a prospective, longitudinal design that allows for (1) standardization and consistency in the measurement of the behavior, (2) analysis of the stability of this behavior at 2 different points in infancy, and (3) examination of the sensitivity and specificity of the marker to autism spectrum disorder (ASD). In this article, we will use the term ASD to refer to a group that includes both autistic disorder and pervasive developmental disorder not otherwise specified. The sample included infants who had an older sibling with ASD (at-risk group), whose diagnosis was confirmed by meeting at least the ASD cutoff on both the Autism Diagnostic Observation Schedule24 (ADOS) and the Social Communication Questionnaire,25 and infants who had an older sibling with typical development (control group), whose lack of diagnosis was confirmed by an intake screening questionnaire and scores lower than the ASD range on the Social Communication Questionnaire. This study was reviewed by each site's institutional review board. Informed consent was obtained in person by trained research staff before the first laboratory visit. The Mullen Scales of Early Learning27 are a standardized, normed developmental assessment for birth through age 68 months that provides an overall index of ability, the Early Learning Composite, and subscale scores of receptive language, expressive language, visual reception, gross motor, and fine motor skills. The ADOS24 is a structured observational assessment that provides opportunities for interaction (eg, play, turn-taking games, imitation) and measures social and communicative behaviors diagnostic of autism. Items are scored from 0 (typical for age or not autistic in quality) to 3 (unquestionably abnormal and autistic in quality). Items are summed into a social-communication algorithm score that provides ranges for ASDs (7-11 points) and autistic disorder (≥12 points). In a controlled experiment, we assessed the number of calls it took a child to respond to his or her name. At a specified time during a longer laboratory session, the experimenter gave the child a small toy to play with (eg, a toy car or a few blocks) while he or she was seated at a table, either in a parent's lap or in a baby seat. The experimenter then walked to a position behind the child, out of view. When the child's attention was focused on the toy, the experimenter called the child's name in a clear voice at normal volume. If the child turned and made eye contact, the experimenter interacted with the child and the task ended. If the child did not respond to the first name call, the experimenter paused for approximately 3 seconds and called the child's name again. In this manner, up to 3 name calls were administered until the child turned and made eye contact or there was no response after 3 calls. Responses were coded from video by a coder who was unaware of group membership. Responses were defined as a clear head turn and eye contact with the examiner. A response score was calculated for each valid press, with responses on the first name call given a 1, responses on the second call given a 2, responses on the third call given a 3, and no response after 3 calls given a 4. Twenty-one percent of the 12-month clips were double-coded for reliability, resulting in an intraclass correlation coefficient of 0.88 between coders. Nineteen percent of the 6-month clips were double-coded, with an intraclass correlation coefficient of 1.0. All presses with nonstandard administration were excluded from analysis. Presses were excluded if (1) the child was not looking at a toy when his or her name was called, (2) the experimenter did not pause between name calls, (3) the child was given a nonstandard toy that captured his or her attention to an excessive degree, and (4) the experimenter mispronounced the child's name. At age 6 months, this excluded 17% of presses for at-risk siblings and 21% of presses for control siblings. At age 12 months, this excluded 15% of presses for at-risk siblings and 18% of presses for control siblings. There was a trend for control infants to respond after fewer calls of their name than at-risk infants, but this did not reach significance. Table 1 shows the breakdown of these scores, with 82% of control infants but only 66% of at-risk infants responding on the first or second call of their name. At the 12-month visit, control infants responded to their name more readily than at-risk infants. A 2 (group) × 4 (response score) contingency table revealed that infants in the control group responded after fewer calls than infants in the at-risk group (Table 2). In a follow-up test, we used a dichotomous score whereby a “pass” required responding by the second name call, and a response on the third call or not at all was considered a failure. An analysis of the resulting 2 (group) × 2 (pass/fail) table revealed a significant effect of group (risk ratio, 1.53 [95% confidence interval (CI), 1.35-1.73]). Specifically, all control infants passed the task, whereas 14% of at-risk infants failed. Valid longitudinal data for both the 6- and 12-month administration of the task were available for 28 control infants and 36 at-risk infants. Developmental performance fell into 1 of 4 categories: passing the task at both ages (pass/pass), failing at age 6 months but later solidifying the skill and passing at age 12 months (fail/pass), passing at age 6 months but failing at age 12 months (pass/fail), and finally, failing to respond to name at both ages (fail/fail). Table 3 illustrates the proportion of children who fell into each response category, by group. Control infants fell into only 2 categories: 79% passed at both ages, while the remaining 21% failed at age 6 months but attained the skill by age 12 months. In contrast, only 50% of at-risk siblings passed the task at both ages, while 39% failed at age 6 months but attained the skill by age 12 months. The proportion of infants falling into each response category differed reliably across groups. This pattern suggests that at-risk infants, as a group, were relatively delayed in attaining the skill of responding to name, but most of them displayed the ability by age 12 months. An additional 8% of the at-risk infants passed the task at age 6 months but failed at age 12 months, and 1 infant failed the task at both ages. The tendency to respond to name is likely the result of a number of factors, including social motivation, auditory discrimination and receptive language skills, and, in the task described herein, a shift in attention from toy to person. To explore possible correlates of response-to-name behavior, we used logistic regression to examine receptive language and attention shifting as 2 predictors of performance at age 12 months. The Mullen receptive language score was calculated as the total raw score, corrected for a similar response-to-name item (ie, it was subtracted from the total). The attention-shifting task involved shaking 2 rattles for 15 seconds, 1 on each side of the child's head, and scoring the number of attention shifts between the 2 rattles (object-object shifts), as well as the number of spontaneous attention shifts between a rattle and the experimenter (object-person shifts). A single score representing the proportion of social attention shifting was then calculated as the number of object-person shifts divided by the total number of shifts (object-person + object-object). Given that there was no variability in response to name in the control group at age 12 months (ie, all passed the task), only data from the at-risk group was used in the analysis (valid data from 3 tasks available for 49 participants). To assess multicollinearity between the 2 predictor variables—receptive language and social attention shifting—we examined the zero-order correlation between the 2 variables. The correlation was not significant (r = 0.18) and inspection of the scatterplot revealed no discernable relationship. We then examined a logistic regression model using both receptive language and attention shifting as predictors of response to name. Results suggested that, although the overall model was significant with both predictors, when we applied a backward stepwise procedure using the Wald statistic as a test of regression weights, only attention shifting remained as a significant predictor. Inspection of means for social attention shifting revealed that, although most subjects exhibited less object-person shifting than object-object shifting (ie, proportion scores <50%), the children who failed to respond to their name exhibited significantly less object-person shifting (mean [SD] 15.24% [16.54%]) than children who did respond to their name (mean [SD] 32.85% [20.12%] [95% CI of mean difference, 0.02-0.38]). In sum, these analyses suggest that the behavior of orienting to name is driven only weakly by receptive language and more prominently by social motivation, here the tendency to spontaneously shift from nonsocial to social stimuli. The results presented thus far demonstrate that infants in our control group performed consistently in our response-to-name task at the age of 12 months; they all disengaged from a toy they were playing with and turned to make eye contact with a stranger by the first or second call of their name. Infants in the at-risk group exhibited a decreased tendency to respond to their name and were less consistent in their patterns of performance between ages 6 and 12 months. A fundamental question that remains is how tightly decreased response to name is linked to outcomes of autism. Outcome was based on a clinical best estimate (CBE) diagnosis by a senior clinical psychologist with extensive experience with developmental disorders, derived from analysis of clinical observation and ADOS and Mullen scores. The CBE outcome categories were ASD, language delay, other delays, and typical development. Autism spectrum disorder outcomes required that the child was over at least the ASD cutoff (7 points) on the ADOS and that the CBE judgment of the supervising health care professional was of Diagnostic and Statistical Manual of Mental Disorders, Fourth Edition autistic disorder or pervasive developmental disorder not otherwise specified. Language delay outcomes required a score on the Mullen expressive language subscale of at least 1 SD lower than the mean, coupled with a score lower than the ASD range on the ADOS. The “other delays” category was designated for children with atypical development of a nature not captured by the previous categories. We examined the 24-month outcome data of 12 children enrolled in the study who failed the task at age 12 months (eg, did not respond on the first or second call). The outcomes of these children were ASD (n = 5), other delays (n = 4), and typical development (n = 3). The “other delays” group included children with 24-month CBE diagnoses of general developmental delay (n = 2), behavioral problems (n = 1), and pragmatic language problems (n = 1). An additional 2 children failed the task at age 12 months but have not yet had their 24-month visit. The specificity of failure to respond to name at age 12 months, calculated using all children with both 12-month response-to-name data and 24-month outcome data (n = 71), was 0.89 (95% CI, 0.78-.95) for ASD specifically and 0.94 (95% CI, 0.83- 0.99) for any developmental delay (including ASD). Next, we looked at response-to-name performance for children in our study with outcomes of ASD at age 24 months and valid response-to-name data at age 12 months. Table 4 presents response-to-name data for these 10 children from the age of 12 months, when the skill is reliably established in the control group, to 24 months of age. Three of these 10 children consistently responded to their name, 3 consistently failed to orient to name, and 4 displayed mixed performance, inconsistently responding to name between 12 and 24 months of age. Although a lack of responding to name is one of the most consistently reported early indicators of autism, it is clear from these data that there is no specific pattern of responding that characterizes our ASD outcome group. Sensitivity was calculated over children with available 12-month response-to-name data and 24-month outcome data, including 10 children with ASD. Sensitivity was 0.50 (95% CI, 0.19-.81) for outcomes of ASD and 0.39 (95% CI, 0.20 - 0.61) for outcomes of any developmental delay. Consistent with previous reports on children with autism, we found that decreased response to name at age 12 months also discriminates children at risk for autism from a control group of infants at low risk. By 12 months of age, all children in our control group, who had no known risk for developmental disorders, oriented on the first or second call of their name. In contrast, 14 infants in the at-risk group failed to orient to their name at 1 year of age. Twelve of these infants have had their 24-month outcome visit: 5 were diagnosed with ASD and 4 demonstrated other developmental delays. We found that failure to respond to name at age 1 year showed very high specificity for 24-month outcomes of ASD specifically (0.89) and for any type of developmental delay (0.94). However, sensitivity was lower (0.50 for ASD; 0.39 for all types of delay). Thus, failure to respond to name at the well-child 1-year check-up may be a useful indicator of children who would benefit from a more thorough developmental assessment. It will not, however, identify all children at risk for developmental problems. Intact response-to-name behavior should not preclude a more comprehensive evaluation in at-risk populations or children who present with other clinical concerns. Poor response to name was not observed in the control group. As such, its utility as a marker of later developmental abnormality may be highest in at-risk groups; it may not be as good an indicator in unselected or low-risk populations. Indeed, the few control infants in our sample who later demonstrated developmental abnormalities (eg, language delays) passed our response-to-name task at age 12 months. Its utility for screening other at-risk cohorts, such as those experiencing premature birth or who have an older sibling with mental retardation, is as yet unknown and must be addressed in future research. The finding of poor response-to-name behavior only in the at-risk group suggests that this behavior may be a familial endophenotype; that is, a phenotype (eg, behavioral, biological) that lies between a disease and a causal genotype.28 Genotypes can be transmitted in families that confer susceptibility for features that are broader than the disorder itself; when this is the case, endophenotypes are expressed both in persons affected with a disorder and in relatives who do not have the full disease. Family members of children with autism have higher rates of social hesitancy or shyness, conversational reciprocity difficulties, speech delays, and highly focused interests than the general population.23 These features have been collectively referred to as the broader autism phenotype. Our data suggest that reduced response to name may be an infant feature of the broader autism phenotype and an endophenotype of autism. Many factors may contribute to the heterogeneity we observed in response-to-name behavior in children with ASD, such as when symptoms manifest, the developmental course autism takes, treatment received, and autism severity. Perhaps surprisingly, receptive language ability was not a key predictor of performance; there was only a weak relationship between response-to-name scores and Mullen receptive language scores at age 12 months in the at-risk group (r = −0.30). A much better predictor of response to name was the number of spontaneous looks between an object and the experimenter's face during an attention-shifting task. This is perhaps not surprising, since both tasks measure the movement of attention between objects and people, but it suggests that orienting to name is an inherently social behavior, more than a receptive language or auditory skill. It will be important to reevaluate the sensitivity and specificity figures reported herein when our full sample has reached the 36-month outcome. The current statistics were computed over a group of 71 children; 10 of these children have developed ASD, which is a very small sample from which to estimate sensitivity. Future work should examine stability of diagnosis and sensitivity and specificity of the response-to-name marker into school-age, to investigate potential relationships to Asperger syndrome, which may not be apparent at the 36-month outcome assessment. In conclusion, in a population at-risk for ASD, response-to-name behavior in the second year of life has high specificity, but relatively lower sensitivity, for identifying children with some type of developmental abnormality. Since this task is easy to administer and score and takes few resources, it could be incorporated into well-child pediatric visits at 12 months of age. If a child fails to orient to name, particularly reliably over time, this child has a high likelihood of some type of developmental abnormality and should be referred for more frequent screening, comprehensive assessment, and, if indicated, preventive early intervention. Correspondence: Aparna S. Nadig, PhD, M.I.N.D. Institute, Office 1262, UC Davis Medical Center, 2825 50th St, Sacramento, CA 95817 (aparna.nadig@ucdmc.ucdavis.edu). Accepted for Publication: November 16, 2006. Author Contributions: Dr Nadig had full access to all the data in the study and takes responsibility for the integrity of the data and the accuracy of the data analysis. Study concept and design: Nadig, Ozonoff, Sigman, and Rogers. Acquisition of data: Nadig, Ozonoff, Young, Rozga, Sigman, and Rogers. Analysis and interpretation of data: Nadig, Ozonoff, and Young. Drafting of the manuscript: Nadig, Ozonoff, and Young. Critical revision of the manuscript for important intellectual content: Nadig, Ozonoff, Young, Rozga, Sigman, and Rogers. Statistical analysis: Nadig, Ozonoff, and Young. Obtained funding: Ozonoff, Sigman, and Rogers. Administrative, technical, and material support: Nadig, Ozonoff, Young, Rozga, and Rogers. Study supervision: Ozonoff and Young. Funding/Support: This research was funded by grant MH068398 from the National Institutes of Health (Dr Ozonoff). Acknowledgment: We would like to acknowledge the contribution of Whitney Mattson, BA, to this study. He very efficiently managed the video coding and was the primary coder of the response-to-name data. We would also like to thank all of the families who participated in this longitudinal study, both at the M.I.N.D. Institute and at the University of California, Los Angeles.